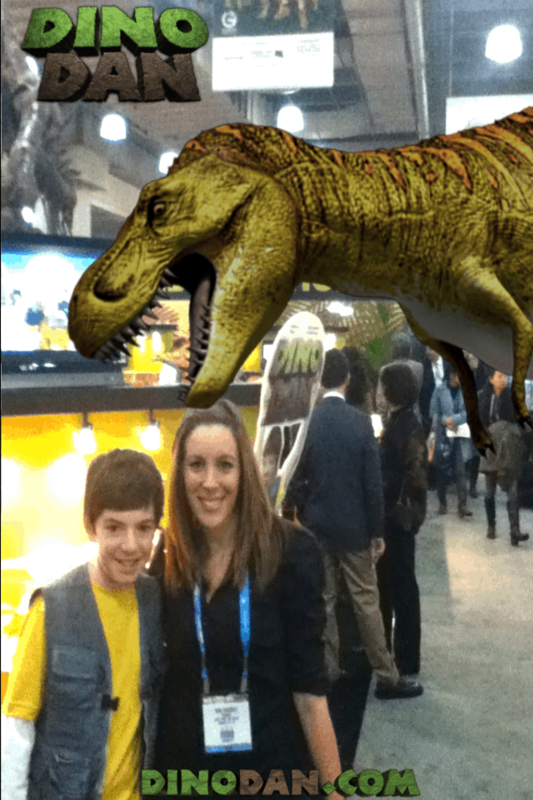 I met Dino Dan at the NY Toy Fair this week and I just had to take a picture with him. If you have kids around the age of 5, you know WHAT I AM TALKING ABOUT! I wasn’t too fond of my NY Toy Fair experience, but when I saw Dino Dan standing there waiting to talk to fans, everything changed for me. How fun! Jason Spevack was adorable. To be honest with you, I’m not so sure he wants me calling him adorable… but I’m going to call a spade a spade. In case you’ve never been to a Toy Fair, let me tell you a little bit about what it was like. Every booth has something to promote. Some have celebrities or TV personalities in an effort to try to entice media to come on over and learn about their new product line or TV listing. Jason Spevack – aka Dino Dan – was in full swing to help promote his show, Dino Dan. He even was in his typical uniform which totally made him stand out from the crowd. Now, I don’t get too excited about celebrities anymore, but I just knew that my children would get such a kick out of that photo. So, I had to run over and try to get a shot. The team insisted that I take the photo with their equipment. I did and as you can see, it came out with the dinodan.com tagging imprinted on the bottom of the photos. I’m all for it. If your children are dinosaur lovers, Nick Jr has a great page to check out! The show is timeless and it’s totally innocent and educational. Something that most of tv is lacking these days. In this series that combines live action with CGI animation, preschoolers are invited to join paleontologist-in-training Dan Henderson and his friends on a journey to an adventure-filled modern-day world where dinosaurs roam freely. There, they uncover clues about the past and teach kids scientific information from new species to dinosaur vocabulary. Are you fans of the show? Have you seen an episode left? Would love to hear! i watched this with the kids…..very smart show!! !